Each member of the family should take turns slathering a thick layer of paint on the palm of one hand. In descending age-order lay each hand, palm-side down on the paper to transfer the paint and create a row or column of handprints. 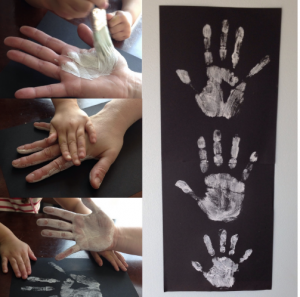 Allow the paint to dry and using a pen or crayon, label each handprint with a name and age. This activity can be updated each year as your family grows! Looking for ideas to have a KODA Family Fun Night this week? Try creating and performing ASL A-Z stories! Creative language play is a great way to explore ASL! There are many variations to how to host an A-Z story night, here are a couple different ways for your family to try out! A-Z Idol: Everyone in the family develops their own A-Z story and performs in front of a panel of judges! A-Z Categories: Starting with a single theme (like animals or sports), each member of your family invents an A-Z story that incorporates or builds on the theme. Extend the game by playing several rounds, each with a unique theme. Team A-Z: Break into teams, or work together as family to create a collective A-Z story. Working in order, each member of the group takes turns contributing one letter/sign to the story. Creative language play is a great way to expand the understanding of, and use of signed language in your home! What A-Z story did your family create? Take a video and show us what your family created together! Organize an ASL book reading event with parents and kids. Contact your local library, bookstore, or school to plan a storytime event in ASL and invite community members to attend. Parents or kids (or both!) can read and sign a story of their choosing! Show off your very own custom shaped cookies at upcoming holiday parties or family gatherings! Designing & creating your own cookie cutters is easy, you’ll just need a foil pan liner along with some other materials, a delicious cookie recipe, and your two hands. Take a peek at the video below to see what the KODAheart team created! People everywhere are trying to catch ‘em all on PokemonGo! Turn this new fad into a fun activity for your family! Get outdoors and search for new creatures as a team. Find yourselves developing name signs for the Pokemon you encounter? Check out @Veditz’s (goo.gl/GfF38S) breakdown of the different Pokemon signs, and contribute your own! For some ideas, also take a look at Langue Turquoise LSF’s video (goo.gl/7VDn3L) It’s a great way to work together, play with language, and come up with creative ways to describe your pokedex! Share with us your favorite pokemon and their name signs below! April showers bring May flowers, or in this case tomatoes, basil, and thyme! To start your garden indoors, you’ll need seed starter pots, soil, and your choice of seeds! 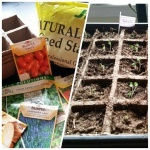 Don’t forget to label each row so when the seeds pop you’ll know which plant is what! Spring is just around the corner and what better way to celebrate than making a May Day Basket to share with others. Directions: first grab some paper and some crayons/markers and begin decorating! When complete, roll up and glue into a cone shape. Don’t forget to add a handle! Fill cone with goodies- we made colored popcorn for our baskets! Once full, fold down the top part of the cone, holding in all of your treats! 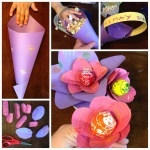 For the lollipop flowers: decorate a sheet of paper, cut out various petal sizes, push the tootsie pop stick in the middle of the petal and keep adding petals, crisscrossed, one over the other until your flower is complete! In May Day tradition, share these with friends, family, and neighbors! For #deafawarenessweek plan a Deaf Community Night Out for your family! Choose a delicious local dining establishment and invite other c/koda families to join you. When making the reservation, take the opportunity to educate restaurant employees; let them know that your group will use signed language(s) to communicate and ask that wait staff has notepads ready at the table to take orders. Engage in a family conversation with kodas about negotiating these experiences with non-signing hearing people. Discuss how to educate hearing people about sign language and appropriate communication styles. Try making personal pizzas! An English muffin, tortilla shell, or a piece of naan bread serve as great pizza crusts! Spread tomato sauce and top with your favorite veggies and cheese. Get creative in your combinations and vote as a family on the best one! What did your family make for dinner? Take a picture and show us what your family created together! Enjoy the autumn weather and fun fall festivities as a family! Make a trip to your local pumpkin patch and explore the outdoors together. Have each member pick out their own pumpkin canvas of choice. Get creative in designing your pumpkin carving! At home, gather the needed supplies to create your own masterpiece and get to work. Post pictures your family creations! What does your#k3family do-do this time of year? Make a snow person as a family- use items/props from around the house! No snow? 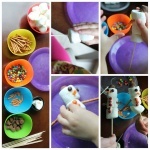 No problem- here is a fun “indoor” snow person activity! Give those winter mittens another fun use; get your family together to play a fun and challenging game! Take turns describing a movie to the others while wearing a pair of finger-less gloves. The performer will only be able to use the “B” or “5” handshapes to describe the plot or the actors while the others try to guess the name of the movie. Don’t forget to talk to each other about the importance of handshapes in signed languages: How does a sign change if we use one handshape instead of another? How does the handshape affect the meaning of depicting verbs or classifiers? Having a Family Fitness Activity is a great way to bond as a family, while at the same time working on keeping everyone in the family physically active. One of our favorite family fitness activities is to hit your neighborhood’s nearest hike and/or bike trail. Load up a backpack or small cooler with supplies like water bottles and healthy snacks, then hop up on your bicycles and explore the trail as a family. Make sure not to forget those helmets (safety first!). Don’t have bikes? You can still lace up those sneakers and go for a run or even a hike on the trail. It’s a great way to stay active while immersing your children (and yourselves) in the beauty of nature. What better way to have fun and infuse a little competition into your evening than a Family Game Night? Get the family together for a fun evening of silly games! Start out with “Read My Lips.” In this game players try to guess words and phrases by observing the lip movements of other players. Break into teams of two. Each player on the team will alternate between two roles; a “speaker”, who mouths the words and phrases, and a “lipreader,” who attempts to guess them. The speaker cannot make any sound or gesture; otherwise, his team forfeits its turn. This game could be a great teaching tool for the hearing friends of your family- show them just how hard lipreading can be! Not a fan of “Read My Lips”? That’s fine, try “Heads Up” instead. "Heads Up! ", a game made popular by TV’s Ellen, is a similar game where one player tries to guess a word or phrase described by the remaining players before the timer runs out! You may work in teams or in pairs for this game. Both of these games can be played as an actual game that you can purchase, or as an app on your iPhone or Android. Check out this HANDY family activity: a colorful family tree! #k3famILY With a canvas or thick paper, colored paint, and a little handiwork you can create beautiful and meaningful wall-art for your home. Start with a surface that is big enough to accommodate the size of your family - larger families will need a larger canvas/paper! 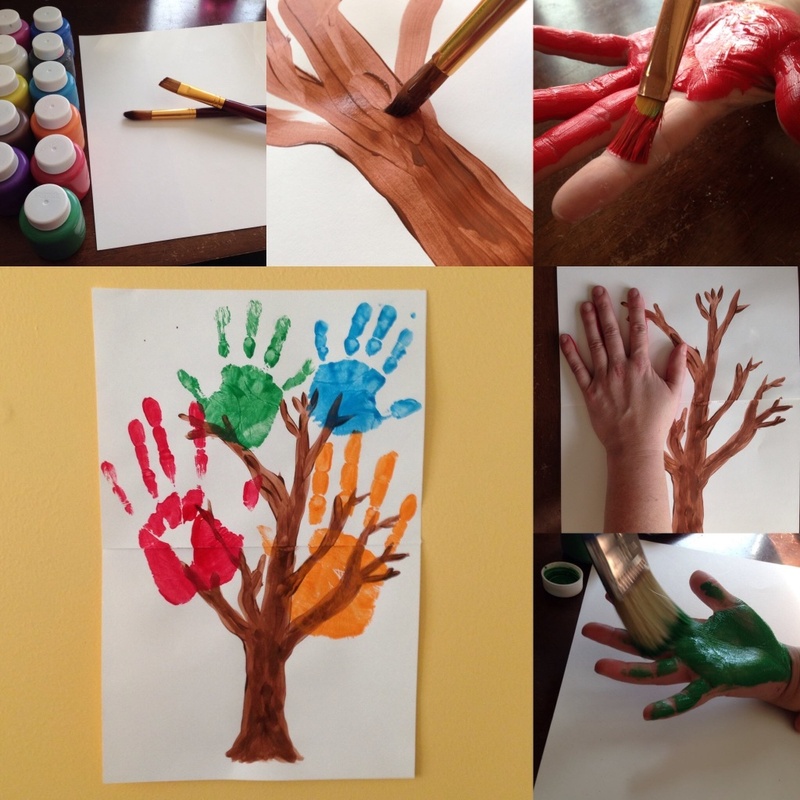 Using dark paint, create the trunk and branches of your family tree. Each member of the family should take turns slathering a thick layer of colored paint on the palm of one hand and place it, palm-side down, on the paper. Allow the paint to dry and add your family name and add a frame. This is a great chance to get creative and have some discussion with kids about your family tree! Discuss extended family members and encourage children to think about the larger tree of which your family is a part. Looking for ideas to have a KODA Family Fun Night this week? Try creating and performing 1-10 stories! Creative language play is a great way to explore signed languages! Group 1-10: Each member takes turns contributing to the story. In numeric order, the first player signs a word using the “ONE” handshape. The next player repeats the previous player’s sign and contributes a new sign using the “TWO” handshape. The game continues with each player repeating the story and adding a sign with the next numerical handshape. 1-10, 10-1: Working in order from 1-10-10-1, each member of the group develops a story using the 1-10 handshapes. Have each member perform the story and vote to choose the most creative. 1-10 Categories: Choose a category (like food or animals) and challenge the group to come up with as many signs as they can with 1-10 handshapes. Take turns contributing words or phrases and see how many your family can come up with! Creative language play is a great way to develop signing vocabularies and to have fun doing it! Record your stories and show us what your family created!